The Bell HSL (Model 61) was an anti-submarine helicopter created by the Bell Helicopter company. It first took flight in 1953 and was introduced four years later in 1957. The 1950s were a time when an urgent need for anti-submarine helicopters became apparent as both the USA and USSR engaged in the Cold War. The US navy held a design competition for such a helicopter and in 1950 Bell’s Model 61 was announced as the winner. Following this, three evaluation models were ordered. These were designated XHSL-1. The Model 61 had a rectangular-section fuselage. It was powered by a massive single Pratt & Whitney R-2800 radial engine. The crew complement consisted of two pilots and two sonar operators. The landing gear consisted of a four-leg and six-wheel design. The helicopter was meant to carry air-to-sea missiles and dipping sonar. 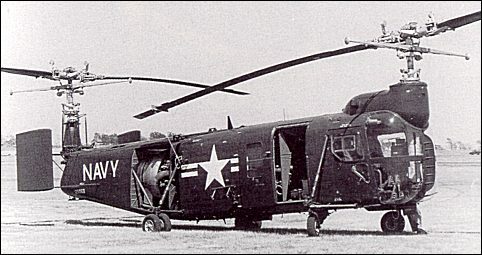 At the time the HSL was produced, it’s tandem-rotor design was the largest US helicopter example. It’s notable as being the only tandem-rotor helicopter Bell ever made. Following the original order of three XHSL-1 units, the Navy was driven by urgency to immediately order more. In total another 160 units were ordered. Technical issues with production means that only 53 were ever delivered. Of these only a handful entered service, the rest went directly to storage and were then struck from the inventory. Do you want to comment the Bell 61 / HSL-1 helicopter?